As wages and transportation costs climb, retailers must be more efficient to keep costs down, say analysts. It's here, retailers, inflation in wages and transportation. In the backdrop of earnings reported this week by Home Depot Inc. (HD - Get Report) , Macy's, Inc. (M - Get Report) , JCPenney Co. Inc. (JCP - Get Report) , Nordstrom, Inc. (JWN - Get Report) and Walmart Inc. (WMT - Get Report) are two main areas of rising costs — wages and transportation — over which retailers have scant control. Each year starting hourly wages are rising in key locales, and some retailers are stepping up and volunteering to pay more. Target Corp. (TGT - Get Report) , for example, committed to up the starting wage to $11 an hour in October and plans to go to $15 an hour by the end of 2020. 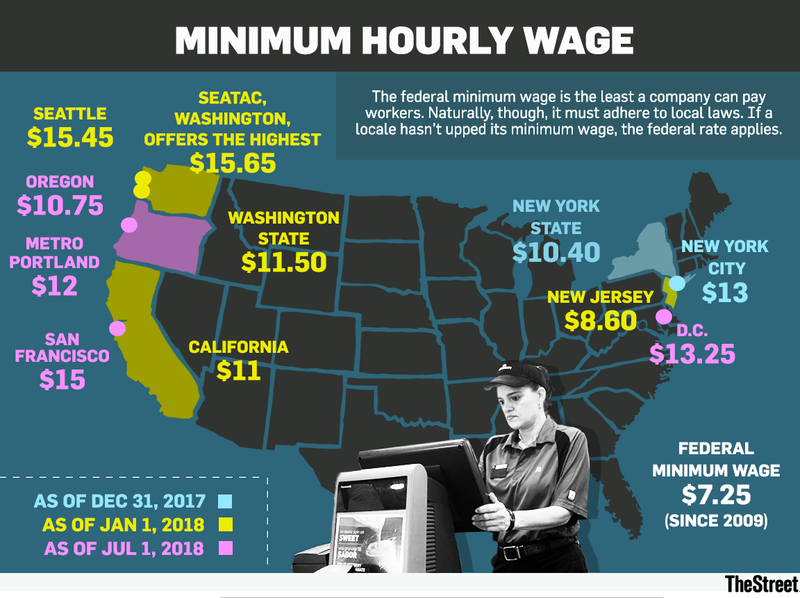 The push for $15 an hour as the floor wage began six years ago when the Fight for $15 pro worker group targeted fast food companies, especially McDonald's Corp. (MCD - Get Report) . Target's lead impacted its peers in the retail space. "That's put pressure on all retailers," analyst Brian Yarbrough of Edward Jones told TheStreet on Thursday, May 17. "If you're in same market, you have to be competitive. If you combine that with a tight labor, it just exacerbates the situation." To contain costs, retailers will need to automate more with devices like self-checkout kiosks and possibly reduce staffs and convert some workers to part-time from full-time, said Yarbrough. Retail specialist Rob Greenspan, president of Retail Consult, agreed: "They have to manage the personnel, it may mean more part-time workers and less workers in stores." What's fueling truck shipping-cost increases are a number of factors, including driver shortage, growing demand for services, rough weather, a rise in fuel costs and the adoption of a new way of tracking drivers and carriers using Electronic Logging Devices, which are federally mandated, and replace paper logs. "Because the purpose of the ELD is to hold drivers and carriers strictly accountable for complying with work-hour limits, to the extend that drivers and carriers are not in compliance, there is a loss of productivity," Avery Vise, vice president of trucking research at FTR Transportation Intelligence, told TheStreet on Thursday. FTR Transportation predicted that long-term truck contract rates are expected to rise 10% to 12% this year, which is the highest jump in over a decade. As a comparison, contract rates rose just 3.9% in 2017. Spot rates are going up even more, or 20% to 30% this year, noted Vise. Yet the good news is that although these rising trucking costs represent a headwind for retailers, it won't affect companies' profitability, said Yarbrough. Yarbrough added that retailers could pass off some of those extra costs to consumers, but it's unwise. "With Amazon [Amazon.com Inc. (AMZN - Get Report) ], it may be more difficult to justify higher prices for customers," said Yarbrough. "I'm not hearing a lot of retailers say they're going to raise prices." Yet, according to the National Retail Federation's David French, the Tax Cuts and Jobs Act, signed into law last year, has cushioned retailers from the added expenses of both extra wages and transport hikes, giving them more cash to develop their businesses. "Tax reform has helped to free up investment in retail technology, wages, skill development and all things that make their stores better and ultimately drive customer value," French told TheStreet on Thursday. French is the senior vice president of government relations for the trade group. French also cited a University of Pennsylvania Wharton School analysis estimating that the new tax law would pump $171 billion into the retail industry through 2027. Amazon.com Inc. and Nordstrom Inc. are holdings in Jim Cramer's Action Alerts PLUS Charitable Trust Portfolio. Want to be alerted before Cramer buys or sells AMZN or JWN? Learn more now.